It’s not the only tree that’s new to the nabe. Since 2007, MillionTreesNYC, an initiative aimed at — you guessed it –bringing one million trees to the city by 2017, has planted more than 814 of them in the Community Board 3 area, according to program manager Andrew Newman. 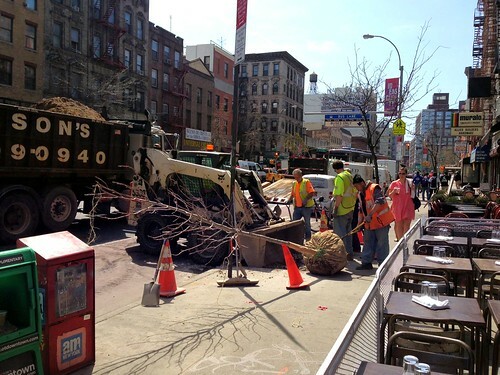 In recent days, The Local spotted newly planted trees on East Sixth and Seventh Streets, also near Second Avenue. The Parks Department plants hundreds of varieties of trees; in the East Village you’ll see oaks, cypress, ginkgoes, lindens and most recently Japanese scholar trees, which grow hanging bean pods that bloom into delicate white flowers. Each tree is labeled with a tag identifying the species, planter and caretaker. The MillionTreesNYC initiative grew out of Mayor Bloomberg’s PlaNYC 2030 program, which called for changes across city agencies in anticipation of the population increase of one million more New York residents by 2030. In a very New York turn of events, it was Bette Midler who approached the Mayor about making tree planting part of the plan. Her non-profit, New York Restoration Project, raises funds to plant on private property while the Parks Department uses city funds to plant on sidewalks and in parks, Mr. Newman said. 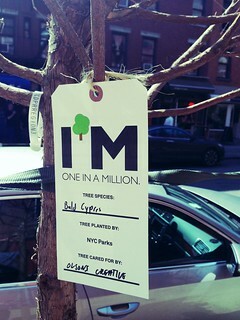 Citywide, the initiative is on track to meet its million-tree goal, with 650,000 trees planted so far. Want one on your block? Ask for one via the Website, and you might just get it: each season about 8,000 trees are planted, based on 10,000 to 11,000 requests.